Professional Chimney Repair and Excellent Service | Wilkens Contracting Inc.
Chimneys should last 50 years or more if correctly maintained and properly equipped. This includes regular cleaning of fireplace flues and ensuring that furnace flues are appropriately lined; but equally important is keeping the masonry of the chimney in good order. This is where we come in – many chimneys need tuckpointing or other masonry repairs over the years since it is a free standing structure which is directly exposed to the elements from all sides. Minor chimney repairs typically needed would be things such as tuckpointing the deep mortar joints and holes, replacing clay flue tiles, or re-cementing the chimney crown to protect from rain and melting snow. If the bricks are chipped, you might also need brick restoration. 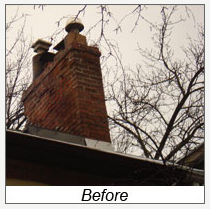 If you have an older house, the chimney may be too far gone to be repaired and thus may need to be re-built. This will be apparent if your chimney is leaning or showing signs of major brick deterioration and/or large voids between the bricks. We do our best to find bricks that match your original ones – including antiques. We colour match the mortar and also finish the top of your chimney to replicate the period design. I am pleased that the chimney is done. It looks great from the inside as well as the outside. Please thank Frank and his crew for the fine job they did. I felt badly that they were working on such incredibly hot days, but they just took that in stride, taking care of themselves while getting the job done in what , to me, was a very short time. They were a pleasure to work with and they took very good care of my garden and of my neighbour’s property, which I greatly appreciated. Best Regards, Chantel. 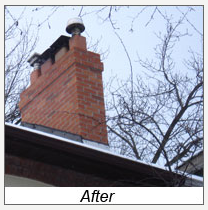 I was looking to have my chimney repaired and got an estimate from you in January, 2008. With unsettling weather over the past few months I couldn’t have it done until the spring. Luke had given me a well written estimate that explained what needed to be done. He gave me the same price almost 5 months later. I would like to give my compliments to David and Luke on their outstanding customer service. They were very helpful. It was a pleasure to have met Allan who did the chimney work. He was very informative whenever I has a question. I just wanted to say thank you on a job well done, Sue. Thank you for a job well done. Special thanks to your workman for his professional work, the house looks much better.Thank you for a clean job site and quick service. Catherine.